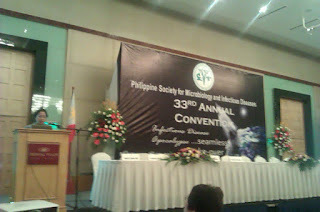 WATSONS PHARMACY and pharmaceutical manufacturer UNILAB supporting the 33rd Annual Convention of the Philippine Society of Microbiology and Infectious Diseases (PSMID), which has the theme “Infectious Disease Apocalypse: Seamless Take Over” on on November 23 – 25, 2011. The convention focuses on the threat of infectious superbugs and how this can be stopped. “Superbugs” are antibiotic-resistant bacteria that pose a deadly threat to humanity. The Internet is place where vast inforamtion can be sent in lightning speeds and reaches out to hundreds to millions of people not only locally but worldwide. Its is crucial for journalists and bloggers that facts are made clear so it won't cause damage to the people being involved. I, as a blogger know that fact and has always check on my sources to make sure that what I write is indeed true and never to sensationalize the topic. But the world wide web is filled with so many inaccurate and irreleveant information that confuses the public. Filtering these is hard and sometimes. biased. Thus the responsibility of keeping news reliable is indeed a MUST for everyone who writes and shares information. I have come across an article about Black PR, Sensational Journalism and Propaganda in Social Media talking about these things with facts, references and links. I grew up with a lot of cartoons yet most of them have turned into lost memories because they lack permanence. 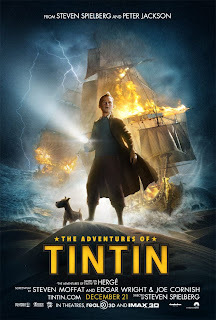 But it was The Adventures of Tintin that actually opened my eyes to many amazing discoveries that inspired me to be a detective and scientist (which I think I also am). Though have not seen all the tintin comics has been fascinated by the bravery of Tintin and the charm and wit of his dog Snowy. 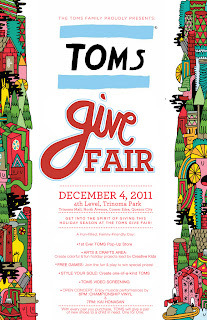 Let's all get together for the TOMS GIVE FAIR on December 4, Sunday at 10am-4pm at the Trinoma Park, 4th Level,Trinoma Mall. Do some Holiday shopping at the first-ever TOMS Pop-Store in the country and, treat yourself to all the wonderful activities TOMS has lined up for you to enjoy a fun-filled family friendly day. It's their way of saying thank you and getting everyone into the Holiday Giving Spirit. Give Joy, Give TOMS. 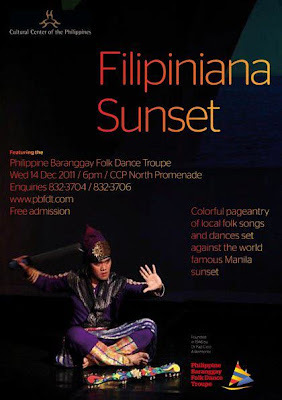 Colourful pageantry of local folk songs and dances set against the world famous Manila sunset. UNICEF Philippines through its online fundraising event Auction for Action held from 1st to 7th October 2012,raised over P3 million to help the poorest and most vulnerable children in the Philippines. The annual online auction is a collaboration between UNICEF and Daphne Osena-Paez, UNICEF Special Advocate for Children, to bring the worlds of art, furniture and design together with advocacy to protect and promote the rights of children. This year’s auction had twice as many items as the first year, held in May 2011. 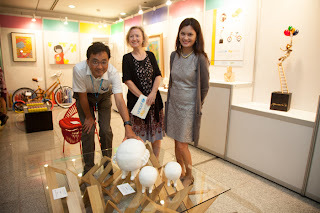 More than 70 Filipino artists and designers brought together by Daphne donated paintings, sculpture, furniture and jewellery items including famous names such as Ramon Orlina, Juvenal Sanso, Kenneth Cobonpue, Manuel Baldemor, Amina Aranaz, KawayanTech and Plet Bolipata. 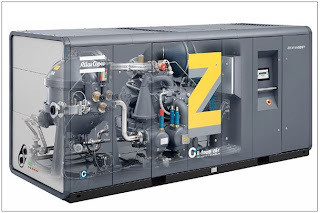 Atlas Copco (Philippines) Inc. recently hosted this year’s Atlas Copco Southeast Asian General Managers’ Meeting held at the Makati Shangri-La Hotel, Manila, with the company’s key executive as they plan to focus business development in Southeast Asia. Upholding their promise for “Sustainable Productivity,” Senior Executive Vice President for Atlas Copco AB and Business Area President Compressor Technique Atlas Copco Group; Stephan Kuhn, and President for Oil Free Air Division, Atlas Copco Airpower N.V; Chris Lybaert, along with other General Managers of their respective offices in Southeast Asia, gathered to discuss sustainable developments for the Philippines. GMA Network Senior Vice President for Entertainment Wilma V. Galvante, Vice President for Program Management Jose Mari R. Abacan, Vice President for GMA Worldwide Roxanne J. Barcelona, and Vice President for News Programs and multi-awarded broadcast journalist Jessica A. Soho were selected as members of the distinguished panel of jurors in the 39th International Emmy Awards. Galvante participated as a juror in the final round of judging for the Best Actress category, where she reviewed entries from Brazil, Hong Kong, Sweden, and United Kingdom. Galvante was a judge in the Emmys in 2006 for the Best Comedy Program category, and in 2008 for the Best Actor category. Crossovers through a different universe is indeed challenging and to some impossible due to the conflicts of timeline and the plot. However Man of Action's best work's, Ben Ten and Generator Rex were able to pull it off and even makes viewers want to ask for another one. 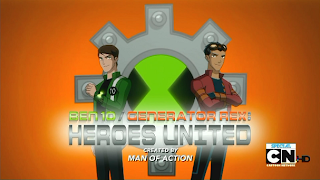 Ben Ten Generator Rex Heroes United is a production of Cartoon Network as a special for the Generator Rex series for its 3rd season. This crossover has been the most awaited event for the series which attracted both the fans of Ben Ten and Generator Rex (like me) alike. This special has also been announced at the San Diego Comic Con just a few months ago. 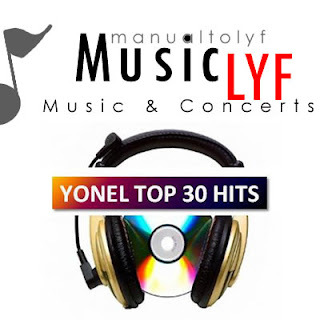 Yonel's Top 30 Hits is back and has a great new look! And for this update Will.i.am's solo single "T.H.E. (The Hardest Ever)" snatched the No.1 spot.This is released November 25, 2011. Stay tuned for more updates and if your favorite songs are in the countdown next week! With local films today stilling clinging to comedy, drama and love stories, thriller movies has been left behind due to the lack of that special factor successful movie film has. 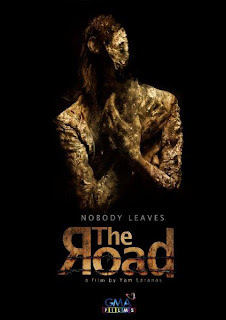 And with many losing faith in the horror industry GMA Films, The Road takes us on a detour from conventional horror into a more darker movie. The movie transcends into 3 parts interconnected with each other with a different timeline. The thrill in this movie is not really with the gore but the story itself and the twisted characters that makes every scene not to be missed. It will leave you an impression that someone or something is watching you every time you drive at night or pass by a long dark road. 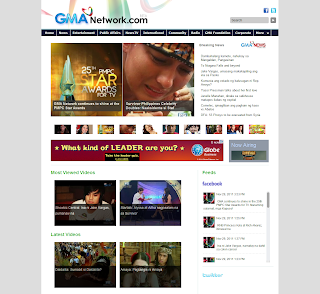 GMA Network and GMA New Media, Inc. are poised to launch the www.gmanetwork.com, the umbrella site for all of the Kapuso Network's media arms. This further enhances its connection with its audience online by providing news, entertainment, information, community, and public service at their fingertips, anytime, anywhere. I usually go to the GMA news website for the latest news and also some of its features like the comics of manix abrera and the opinion blogs. now with a better interface which integrates GMA sectors with a very user friendly interface. Spanning everything from the latest breaking news to the disc jockeys whose voices keep you company on the airwaves, GMANetwork.com gives users access to all of GMA's sites, GMA News Online's breaking news, social media feed as well exclusive videos and program guides. He may have been born in 1635, but Captain Morgan is no stranger to the present-day party scene. 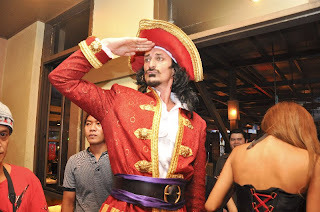 The Philippines got a taste of this when the fun-loving, swashbuckling Captain arrived in Manila, with his Morganettes, and treasure chest of his Captain Morgan Original Spiced Rum in tow. Tides Grill and Bistro, Scout Albano Street, South Triangle, Q.C. became the venue where Captain Henry Morgan introduced the drink to hundreds of consumers. His signature cocktail, Captain and Cola, has been a proven hit around the world and was received with the same kind of enthusiasm by the local market. 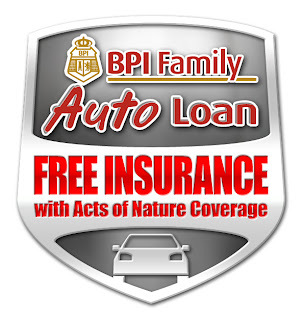 BPI Family Savings Bank’s FREE 1 year comprehensive insurance with Acts of Nature coverage promo is extended up to December 1, 2011. The promo that started in October this year, lives up to its promise of making it easy for clients who aspire to own the latest car models available, at the same time provide them with utmost convenience and security that they need. The promo was introduced to meet the dream of Filipinos of owning the latest car models available in the market and the same time provide utmost comfort and convenience as clients may just log on to www.bpiloans.com to apply. A grand celebration at Manila’s SM Mall of Asia on Friday, marked an end to Yahoo! Philippines’ five-week online adventure – the Purple Hunt Family Edition 3.0 – which saw the mother-daughter team of Carolyn M. Beronilla and Catherine Ester Beronilla from Las Piñas, walk away with the coveted prize of a P 2.2 million condo by Camella Homes. Hosted by Chloe McCulley, the 2011 Miss World Philippines 2nd Princess, the event attracted over 400 Filipinos to take part in daylong activities that involved live music performance from the popular rock band, The Dawn, games and interactive contests. The love guru who started it all is making a big comeback on radio, the medium where he first became a household name in the late 1980s. Started Nov 22, Joe D’ Mango will give inspiration to listeners twice a week with his playlist of classic love songs and expert advice on love and relationships via his popular program “Joe D’ Mango Love Notes” on DZMM Radyo Patrol 630, the leading AM radio station in Mega Manila. Bea Binene, one of GMA 7’s youngest teen star together with ABS-CBN’s Empress Schuck and Dino Imperial will join BUM apparel’s biggest fashion show called “REVEAL YOUR DARKSIDE” on November 25/Friday, 6pm at the Mall of Asia Music Hall. 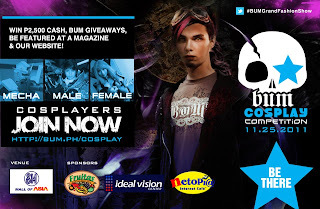 As BUM’s latest celebrity endorser, BEA will strut the runway wearing the latest Holiday Collection of BUM with “Cosplay” as theme of the show as culminating activity of BUM’s online Cosplay Contest launched last August 2011. The Pirate Brothers, is an action-packed tale of truth, brotherhood and vengeance. 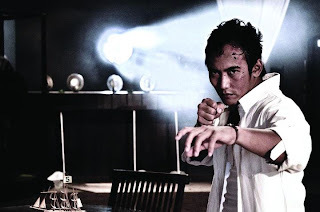 When young Sunny loses his protective brother to a gang of thugs, he vows from then on to seek eventual revenge. Years later, he ends up in an orphanage where he befriends an innocent boy who has lost both parents. Verdy, the boy, suggests that he and Sunny become brothers, so that they themselves can be a family. Sunny accepts and protects Verdy as once his big brother protected him. Their paths split when Verdy is adopted by a wealthy family. UNICEF Philippines and eBay Philippines launches its second online fundraising campaign through UNICEF Auction for Action: The Manny Baldemor Sabrosa Series from December 5 to 11, 2011 on www.ebay.ph/unicef. As one of the featured artists in the first UNICEF Auction for Action last May, UNICEF visual artist Manny Baldemor once again shares his generous talent for the benefit of UNICEF programs for children in the Philippines and worldwide. “I have received so many blessings that it’s only right to share and give back. Children’s welfare has always been close to my heart and that’s why I work with UNICEF Philippines because they help children in the poorest and most disadvantaged areas,” shares Baldemor. Local clothing brand BUM brings the Cosplay trend to the fore with a one-of-a-kind fashion show at the SM Mall of Asia. If you have a story to tell, don’t keep it to yourself. Flaunt and let the world know through fashion. Homeowners might find it surprising that indoor air can sometimes be worse than outdoor air. According to the U.S Environmental Protection Agency (U.S EPA), the air we breathe inside our homes can be two to five times worse than air outdoors. This stunning discovery is identified as posing an even greater risk to our health as most people spend 90% of their times indoors. Particles such as pollen, mold spores, dust mites, and other allergens, visible or not, carry viruses and bacteria that may harm us and our family’s health. To make things even more surprising, some of the most widely-used cleaning methods, such as sweeping and vacuuming, can even increase the circulation of such particles. For moms, protecting the health and safety of their children is their primary concern. Even when they clean the house using the latest cleaning tools and equipments and having the best air quality would not undermine the existence of these dangerous microscopic things. 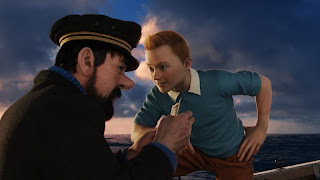 Growing up in England, Bell had been a Tintin fan since childhood. “There’s something about Hergé’s art that leaves an imprint on you. It’s unforgettable,” he muses. But now, he had the chance to imprint the character with tangible, human emotions and that thrilled him. There’s only a few more days till December! Have any of you started shopping for gifts already? If not, then you’re in luck! RCBC Bankard brings you the much-awaited BIG GARMENTS SALE for your early Christmas shopping extravaganza! Make a mad dash to the warehouse sale and enjoy great shopping for everyone on your gift list. If you’re an RCBC Bankard cardholder, you can avail of exclusive 0% Installment for 3 months. Best deal ever if you have a long list of people to buy gifts for! Music has always been a universal language. It ties everyone together and unites us. But with the rise of the Internet, the media landscape has definitely changed. 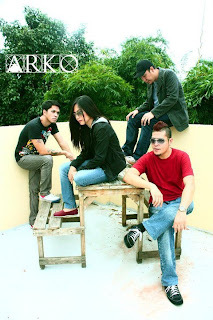 This is also what these four individuals from various fields, thought of when they came up with the newest OPM website FANSILOG.com. Freelance video producer Frank Lloyd Mamaril, together with Robbie Ortega (licensed engineer), Jason Talon (IT Practitioner), and Raul Robles (IT Support Engineer), coming from an all-male choral group themselves, music was really in their system. It didn’t take long when they came up with an idea of an all-filipino website catering to music enthusiasts and fans alike. Fansilog is an all- Filipino music content website where OPM Artists and fans can log in and exchange. Artists and bands can upload their songs and videos and let their fans know where their next gig will be and at the same time view exclusive content like interviews, music videos bootlegs, and versions. Now on the next installment of the BonPen Diaries in Quezon we are still in the host town Pitogo and after checking out the historical places in the town, we had lunch and went on our way to check out the Agri Fair beside the historical church of the town (Conversion of St. Paul). The Agri Fair features booths from the towns in the BonPen region with signature products on sale and also at affordable prices. The booths are also designed very well to compete for the best booth award . For 42 years, Ballet Philippines has been the premier professional ballet and contemporary dance company of the country, and our commitment to the arts and culture has kept us at the forefront of dance in the Philippines. On January 17 and 18, 2012, Ballet Philippines presents TANGO FIRE, the renowned Argentine Tango group from Buenos Aires, at the Newport Performing Arts Theater in Resorts World Manila at 8 PM. This is a fundraising performance that will benefit Ballet Philippines’ Arts Education Program “ Share the Magic.” We bring children from public schools who would not otherwise have the chance to watch a ballet and expose them to the beauty, precision and grandeur of the art. With less than a decade of as the Archbishop/Cardinal of Manila. Cardinal Rosales will be retiring and the seat of the Archdiocese of Manila will be administered by Archbishop-elect (by the Vatican) Bishop Chito Tagle. Though not yet officially installed, Cardinal Rosales sends the Filipino Catholic Community with a message on video (below) as a way of being thankful for the church (people) for supporting his projects and made a big difference. Though not as controversial as Cardinal Sin, he s unusual charm toward the youth. 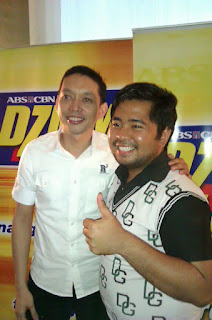 His famous project is the Piondo ng Pinoy which garnered funds in supporting orphanes, hospital etc. Now lets hear his Final Message as Cardinal. Here at the Pangasinan Digital Life ICT Congress! 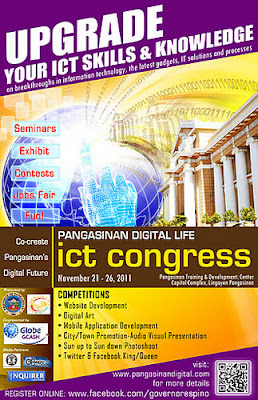 Here now at Lingayen at the Provincial Capitol Complex for the Pangasinan Digital Life ICT Congress that starts today, November 21 to 26, 2011. Some of speakers will be Vince Golangco (wheninmanila.com), Janette Toral (digital filipino), Carlo Ople (Unbox.ph, TV 5) and many more (including your truly!). Its a great move especially for the people of Pangasinan, though agricultural in nature has now embraced the dawn of the digital age that is now improving productivity and connection between the government and also the citizens. For more information about the program and schedules visit www.pangasinandigital.com. Like them on facebook, same with their supportive Governor Amado Espino. The topics are made to suit the needs of specific citizens of Pangasinan. With this milestone, many other provincial government officials will support the growth of Information Technology in provinces where they can indeed make a great difference and improvement of the lives of its people.